Bottled: 9/26/16, Barrel No: 89, Rick No: 15, Warehouse H.
Twin Liquors is the best chain retailer in Austin: unlike the big-box stores (Specs, Total Wine), they don't just treat me like a number and farm out their best stuff to bars. They appreciate their real whisky fans--especially one as transcendently brilliant as me--so when something fun arrives, they set it aside. Recently they got some bottles of their Blanton's store pick, which you don't often see these days. I'm a big fan of Blanton's Straight from the Barrel, which I routinely order from Europe. 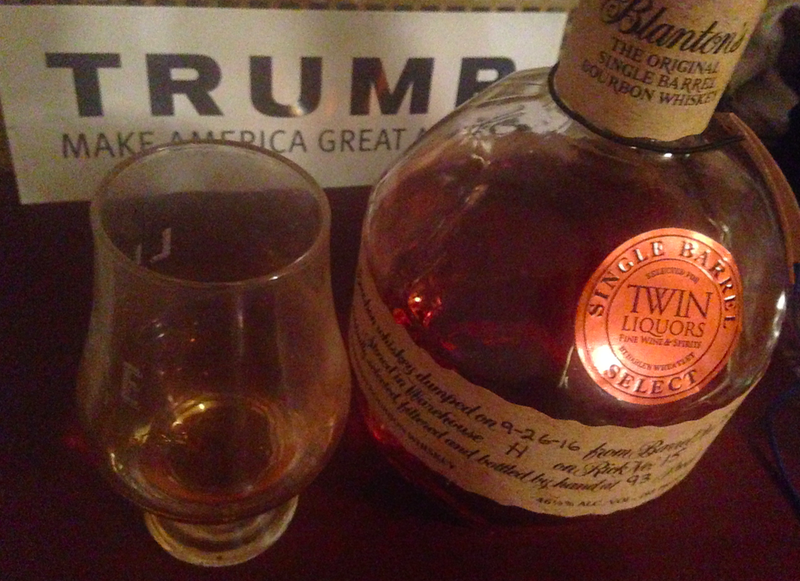 But the regular Blanton's never wowed me. Nevertheless, who am I to control my impulses? If you put bottles in front of me, I'm helpless. Student loan payments can come later. The nose is generic Buffalo Trace, in a good way, with few of the overly-acidic notes that I dislike in their lesser casks. And it's pleasant to drink, though hardly earth-shattering. Some light fruit, rye spice, and a breezy kiss of oak. It's well balanced, but tastes so dilute for some reason. A middle-of-the-road bourbon. Fine but forgettable. Blind, you might guess it was Eagle Rare 90 proof, which isn't a compliment. Lately, some have said that Buffalo Trace has been offering weaker slates of casks to retailers, so perhaps that was the case here. 82 pts/B-. Ehhhh, it's inoffensive and easy to sip. But I need a bourbon that shocks my conscience and terrorizes my dreams.